A false economy is cutting back on something to make a saving on money, but ending up spending more in the long run. When you’re set on saving money in as many ways as possible, as a lot of people are at the moment, it can be all too easy to end living by a false economy. To avoid a false economy you need to have a keen eye for when a bargain is not a bargain. 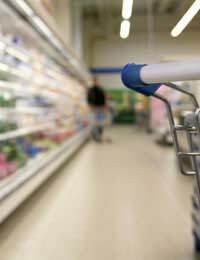 Food shopping is one of the areas where many people can cut down and make real savings on their monthly spend. However, as is the key to all budgeting, it’s important to be realistic. Buying food just because it’s cheap can end up being unhealthy physically and financially. Cheap cuts of meat and processed foods may sometimes be cheaper but can have a negative effect on health. Similarly, if you and your family don’t really like the food you’re likely to end up re-buying replacement food anyway, or worse spending money on takeaways or meals out. Discounts on products you need or would buy anyway can be a great way of spending less. The key is, though, not buying things just because they’re discounted through vouchers or in the sale. Generally speaking, you should use vouchers, coupons and sales around your shopping list, that is to buy products that you would buy anyway. There is obviously no point in getting some heavily discounted goods that you don’t really need as you are spending money that you wouldn’t have spent anyway, therefore losing money. Many people think clothing and shoes are one of the main false economy traps that people fall into. Cheap shoes and clothes tend to be a false economy because they wear out faster than better quality items. So, although the individual items cost less, you could end up spending more by buying them more often. This might not be so much of an issue with growing children as you’ll regularly need to replace clothes and shoes anyway. One trap that many people fall into is making their budget unrealistically tight. If at all possible you should try and budget at least a small amount of money for having some fun, for example going to the cinema, having an occasional glass of wine, or whatever you like to do for entertainment. It might feel virtuous using all your money to save or pay off debt. However, you could end up getting into a purge and splurge cycle of spending or going off budget completely because it does not fit in with how you live. There are many other ways that you can end up living by a false economy and the pitfalls are different for everyone. To avoid it you really need to assess your own spending and lifestyle and prioritise what’s important to you whilst living within your means. Think about what you are willing to sacrifice and what you definitely won’t compromise on and work from there.